We went and picked out two slabs on Monday, and today we had the installers come to measure our counter and template things for fabrication. We had to clean everything off the counters, which gave us a “new house” look in the kitchen. The guy arrived, a measuring guy without a lot of information. He was foreign, and we definitely had a language barrier. As we tried to ask questions about how things might change or what we might do differently, we struggled to get some answers. This was a couple weeks ago and next week, about 9 days from now, we’ll have new counters and a new sink. Good bye old laminate! We started moving Kendall yesterday and she got to sleep in her new room for the first time last night. She said it was great and she loves having all the space. We had to take apart part of her bed, because the space was a little too tight trying to get around the corners. But we only took one side apart and then Kendall helped put it back together. No help from this guy, who just wanted to be a part of the whole process. More pictures, books, and other stuff to be moved today so we can get Kendall’s old room ready as a guest room. For our troops today. Delaney wasn’t feeling good and so we didn’t make the Boy Scout ceremony this morning. However I stopped before my run, and took a moment to remember our soldiers. Nothing scheduled or planned, but another busy day and I am tired. We started by moving Kendall's bed and a few things to her new room. A nice easy start to the day after sleeping in a bit. Kendall got tired, so we called it quits after an hour or so, with not too much moved, but enough. Tia went to ride with a friend, so I wanted to do chores. First it was a run for day 990. Exciting to be getting close to 4 digits. Then it was putting on the second running board on Tia's truck with a little help from Delaney. He remembered that I'd done the first one myself and said I didn't need help, but I pressed him into service. We got that on, Tia left, and Delaney disappeared. I wasn't sure what to do, but I decided to start with the gutters. One of them had been leaking a ton of water the last time it rained, so I took down the bend and discovered a nice block and a racketball in there. Those were cleaned out and I'm sure that will work the next time it rains. Then it was cleaning car time. I started inside the Prius, vacuuming it out, and then armor all'ing all the surfaces. Kendall came out as I was about half done and helped me finish, then it was washing the outsides of that and the Surburban. I think Kendall got me as wet as the cars, but we got them clean. I was ambitious, so it was cleaning the windows and rain-x'ing them all on both cars. That was hard on the shoulders, but I've been wanting to get it done. Since it was cooling off, I also decided to try a wax experiment. I did the front of the Surburban and the front driver's side of the Prius, just to see how it looks. I think it makes a difference, but we'll see. finally we were waiting for Tia, so Delaney and I did a little weight lifting. Good exercise for us. Not the book I’d normally read, but someone put a book club challenge up on Facebook and Hyperion was the book, so I grabbed it. It started slow, but as I got into it, I could hardly put it down. A future world, where planets are connected by Farcasters, devices that are portals allowing you to step instantly to another place. The rich have houses that are interconnected rooms, with each of them literally on another planet. It’s amazing to think about, and fascinating. Despite all this, there are 7 pilgrims on a journey to Hyperion, a planet not yet connected to the Farcaster network, and home of a mysterious creature called the Shrike that kills many and grants the wish of one pilgrim. Apparently a group of humans, the Ousters, grew apart from the rest of humanity centuries ago and are coming back to wage war on Hyperion. As both sides gather, these pilgrims were chosen to journey across Hyperion to the Time Tombs, a series of structures that appear to be moving backwards in time, and confront the Shrike. They can’t fly because when ships approach the Time Tombs, they arrive, but without crews. So they must make the journey across the land, using more primitive transports. It’s slow to start, and we don’t’ know much about the era or technology, or even social conventions. However as they travel, reluctantly and not necessarily friendly, each tells their story of why they think they were chosen for this journey. As they do, the stories are fascinating and we learn about the universe of the book. What’s amazing is that the book ends just as they are getting near the Time Tombs. 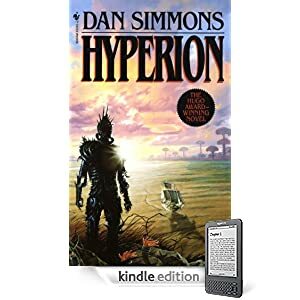 I had to hurry up and go by The Fall of Hyperion to continue the story. I grabbed this one as soon as I’d finished #2, despite having other books to read. 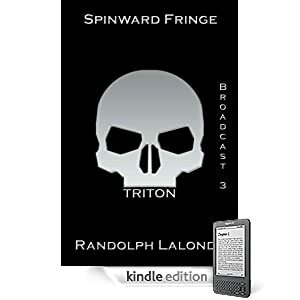 Triton continues the story of Captain Valance who has taken his crew in command of Triton, the Sol defense vessel, to a new system. It’s an amazing ship, but woefully undermanned. This book talks of the amazing technologies, but also shows the challenges of running a large ship. The captain can’t do everything himself, and we see the characters develop and struggle to find their places in the story. We also start to see the Fourth Fall of mankind, with Regent Galactic releasing a horrible AI virus on the universe that has billions being killed. It’s an exciting, but sad book. I think it’s worth reading, but you definitely need to read 1 and 2 before this one. A great quote "We are now witnessing a global societal struggle to assure universal delivery of our know-how." from a medical school commencement called Cowboys and Pit Crews at http://nyr.kr/j5b1nS. It talks about how medicine has changed and in many ways for the better, in some for the worse. It’s an interesting look at costs, and how they don’t often equate to better care. That’s a problem, I think, in our system. We’ve raised costs, partially because we have more options and ways to treat things, partially because of inefficiencies, and partially because of profit, which I think is bad. Profit isn’t bad, but profiting at the expense of denying care is bad. We have to find a way to better mix these goals, and I am actually hoping that Generation Y, with an emphasis on things in their lives other than profit (to a large extent) will make changes as they mature. That’s sad, but it also shows that we have interconnections that are problematic. We spend more on schools, but we’re not spending on schools. We’re spending more hidden costs on health care. At the school board meeting a few months ago, I went and heard that next year our teachers will get a high deductible plan, meaning a $2k/individual/$4k family deductable every year. If a teacher’s family is sick, based on what they earn ($30-60k), $4k is a significant cost. No wonder we lose good teachers more and more. It’s not that money is everything, but that kind of loss, or the fear of that loss, could dramatically impact a teacher’s life. It certainly might make them think that a job paying $10-20k more a year gives security. Maybe a larger scale public health plan is a good idea at least for public employees? I don’t know. The author of this piece, Atul Gawande, wrote a great book: The Checklist Manifesto, that I really enjoyed reading. It made me think that my own field, that of data, could benefit from some re-thinking and re-tooling to standardize and prevent the simple mistakes. I recommend it and it’s worth the read. After running errands with Tia, it was a day to fix a few things around the house. First was the microwave. Tia and I had purchased a new one the other day and I ordered the install, but at $130, it bothered me. So I asked her if we could try it and get the microwave installed this weekend and then cancel the install next week. We unscrewed the old one and it came out easy after lunch. The old bracket looked OK, and since there were already about 6 holes in the tile behind the microwave, we decided to see if the new one could reuse anything. It's about 1.5" taller, so the bracket is lower. That meant we had to line up new holes and drill them out. I found out that my metal/wood bits don't do so well on ceramic and I could feel my back cramping from pushing. I've got the start of blisters on my hands as well, but I got three holes drilled and the bracket up. Next we drilled holes in the top, using the template, but things didn't line up. In fact, we had to use a file to make the holes wide, which made us nervous, but it seemed to work OK and after lifting the new oven up there 3 or 4 times, we had it installed and it worked. Hot water in a glass was our test and then we walked away after cleaning things up. It was still early, so I went out to get Tia's running boards on. I'd looked at directions the other day and it didn't seem hard, but I've thought that before. This time, however, I was right. A few u-bolts into holes under the rocker panel and then bolt on 4 brackets and then the board. Much smoother than I thought. I'd have gotten the second one done, but everyone wanted to go play tennis, so we headed out for some silly double tennis with the little ones. A good day, lots done, but I am beat. Another running board tomorrow, but other than that I'm thinking to take it easy. I think it’s done after 5 years. Delaney came upstairs yesterday and asked if something was wrong with the microwave. I asked him what he meant, since I’d used it that morning, and he said it had fire in it. Yikes! I told him not to use it and went down to look at it. Sure enough, it had a black trail of stuff on the side by the metal casing where the microwaves are generated. I had replaced that last year, but there was a worn spot on the casing and it was sparking quite a bit. Unplugged it, told Tia, and we looked at replacements online. $200 gets you a microwave above the stove, and there are lots of choices. Since a service call is going to be $100-150, it doesn’t seem like it’s worth it to call, especially when they might say “get a new one” with the worn areas. I’d forgotten until today, when I went to make lunch after running. I was starving and tried pressing buttons a few times on the microwave before I remembered. Grrrrrrrrr. I was in a hurry, and hungry, so I ran to Subway, well, I drove to Subway. But it did spark me to consider going to get a new one tonight from Best Buy. That is one handy device that I realize that I use a lot. Amazon released their list of the most well read cities in 2011 (based on sales).. Denver isn’t there, but Boulder is. Mostly liberal cities, which is interesting to me. Mostly college towns as well, with the exception of Miami. I needed an image of a “great idea”, and decided to use a light bulb. I started looking through Flickr and then realized I could just as easily do my own picture. So I enlisted Kendall for this series of shots. We had fun, with Kendall holding some of them and laughing the whole time. It was a fun silly few minutes in our day. It’s from an article on the 9/11 memorial and how an algorithm was used to inscribe the names in particular places. The people in your lives matter much more than the things you accomplish, and certainly more than the money you make. At the end of your time, it is those connections that will be what you most remember. The conversations you had, the touches made by people. Remember that as you live each day, and as you interact with people. Build the connections that matter to you. That’s the world that I think is more fun. My thirteenth wedding anniversary today. Happier today than I was thirteen years ago and I have a wonderful life with my beautiful bride. It’s nice to have summer break in effect in the mornings. I can sleep in a bit, which I’m trying to do and get on a better schedule for our lives. Right now Tia and I was exhausted around 10 am, but keep waking up at 6. Not quite the schedule we want, especially with work and daylight until 8pm or later. We’d rather be up at 7:30-8. I took advantage today to sleep in until 8. I like sleeping in. Baseball today, and we won. Our first win of the season, 3-0 against a former teammate. It was a quick game, even though it felt slow. I played 3rd and didn't see a ball or throw my way. However we played solid defense, I think only one error that didn't matter, and a few good plays. On the flip side, we didn't really hit well, a few scattered hits, but a few mistakes on their part that ended up scoring us runs. 3 or 4 bad throws to first that caused runs to scores or runners to advance. I batted, but 0-3, all Ks, one I think was a bad call on the third, but one I couldn't reach and one I didn't swing at thinking it might be low. Bad decision on my part. Didn't feel in a rhythm all game, and at the plate was pulling my head. I need some serious batting practice. Still good to play and get a win. Beautiful day, and now I'm off for 3 weeks with the holiday and travel. Hard to believe that Kendall is 10 years old. Her birthday was last week and we took the whole family and aunt and uncle to Dave and Busters last Sunday. Kendall enjoyed dinner with us all at what has become a bit of a tradition for her. After dinner we wandered around playing games. She has a whole routine of things she wants to do. We typically go to a horse race first where we compete against each other, rolling balls into holes to move the horses along. 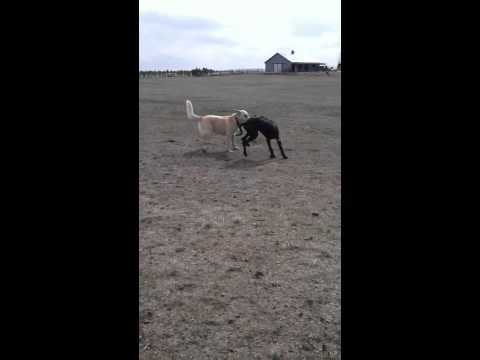 We split a pair of races, her and I. After that we did a little skee ball before heading over to the slot-machine-like coin roller where we get tickets for knocking coins off a ledge. Kendall and I have gotten pretty good at it and racked up over 1,000 tickets with the $20 we spent. Not a great bargain, but it’s fun. Then it’s horse racing, this time in a virtual game. We had to wait a bit because the 8 machines were packed with adults, but Kendall was willing to do so and we finally got in there to race a few times. A late night, back home after 10, and the kids were tired all week. We had planned a party with her friends for last night at Pump It Up. We headed over there in the early evening, me with a car full of kids. Not my favorite commute, but not too bad. The kids got to jump and play, running all around burning energy before coming into the party room for pizza, cake, and presents. Very cool. Afterwards, posing for a picture before coming home where I crashed and Kendall had a couple friends sleeping over. A long day at Bass Pro Shops with the Scouts for a fundraiser. We do 2-3 a year, and they pay for most of Delaney’s dues. It’s a good way for him to fund his scouting stuff, and he’s learned to work well with other kids, learned to work for money, and getting better at cooking. Today we acted as transport, loading up the Suburban with all kinds of grills, supplies, and stuff needed. Delaney and I packed it up last night after Kendall’s party so it was ready to go this am. Up early, we drove to North Denver to set up for the day. Delaney did a good job getting things set up with the other kids. There were 4-5 adults there in the am that helped us get everything ready to go and about an hour after we arrived, we were cooking. Delaney spent a bunch of time early as the grill master. He seemed to enjoy that and I think he can finally be trusted to cook hot dogs and hamburgers on his own. Not that I’ll let him when I’m around since I like it, but he’s qualified if we need him. After a shift on the grill, he went inside to help do demos for customers. I didn’t wander in, but wish I had. Apparently they were showing how to use a compass and it was a steady stream of people stopping by to see the scouts do their thing. Another parent and I working the Dutch Ovens, which I like. We made cherry and apply cobbler, 15 batches throughout the day and they went over well. People enjoyed them and lots of questions about how to make it and how to use a Dutch Oven. Always fun. Hard work, lots of bending over, and I was definitely a little tired and sore at the end. We packed up at 4 and headed home, a good day’s work behind us. Last night Tia was getting tired from her early morning flight back from Boston. I wasn't much better, having not slept great without her for a couple nights. But I needed to shop for Kendall's party tonight as well as load up stuff for a Boy Scout fundraiser on Saturday. I headed out, tired, and in need of a pick me up. 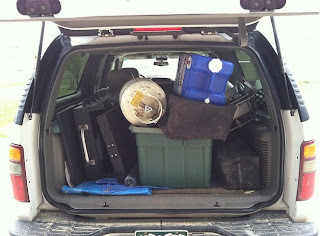 I loaded the Suburban, and as you can see, it was loaded. I got most of the infrastructure for cooking stuff (burgers, dogs, brats) and the other Dad got the coolers and tables, with his little Nissan SUV packed just as full. I had to leave a little room because after I hit the Scout shed, it was off to Wal-Mart for even more packing. I ended up buying the drinks, ice cream, etc. for the party tonight. I managed to only wander around the store once, grabbing a selection of things we needed before coming home and heading off to bed fairly quickly. I needed it. Eyes sore last night, Tia asleep next to me, I was happy to get to bed and not have to be up to get kids to school today. My lovely wife came home this morning, landing just after 9am. 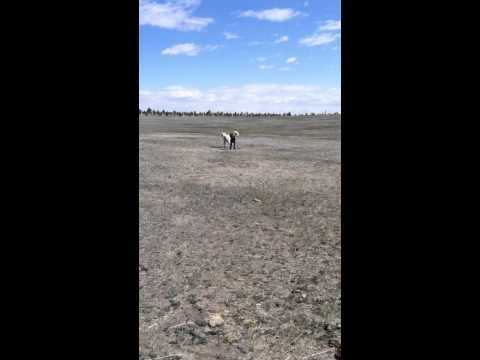 I was out feeding horses then, trudging through the mud with a wheelbarrow of hay. She’s been traveling every week it seems like and leaves again on Sunday for a horse vacation, so I finished up quickly, knocked off a little work, and then headed out to meet her for a late breakfast. I am so ready for school to get out and the chance to sleep in. As hard as it can be with the kids home most of the summer, I certainly won’t miss those 6am wakeups for the bus. I have been having trouble at times seeing my 19” monitor. I have dual monitors, with the right one being smaller, 19”, than the main one, 23”. After using Windows Maginfy a lot, and struggling to see things that were that far away, I decided last week to upgrade and get another 23” one. It came Saturday, but it wasn’t until today that I had time to switch them out and replace the 19” one. I finally did and it is amazing. It’s bright and sharp, and makes my other 23” one look old and dull. Makes me think I should have gotten two new monitors. This piece seems to wander back and forth, talking about the arguments for an against bandwidth caps. I am for no caps. I know that when I have had plans that limited bandwidth, I would be very hesitant at all to click on anything, or download anything. Because it’s too hard to keep track of a cap. Now if a cell OS could send me a daily report, or let me know in an easy way when I’m doing something with a lot of bandwidth, I’d be interested. However I do see that there is this concern that lots of bandwidth is being used for trivial things like YouTube videos. And I can see that someone downloading 2GB+ a month is likely doing a lot more leisure activity than productive work. Not always, but potentially. It’s a tough issue, and one I’m not sure about. Instead of caps, or QOS limits, I think I’d rather see telcos reverse things and allow someone to pay for QOS for traffic. Want phone service, pay some nominal amount to get bandwidth guarantees for voice. Or some minimum amount for data. We all do share the pipes, so potentially this might just “slow down” the traffic for the high video/torrent people if enough of their neighbors are paying for minimum bandwidth. Delaney spent the weekend at Peaceful Valley Scout ranch for his Order of the Arrow Ordeal weekend. He was elected a few months ago, and this was the first part of his initiation into the brotherhood, which will take another 10 months or so for him to complete. However this was the hard weekend. We packed Friday afternoon, with me insisting he take a knit hat, sweatshirt, gloves, and hiking boots, none of which he thought to bring. He was glad I insisted and wished he’d have had even another shirt. We definitely need to make sure he has long johns for future trips. We did pack a new pillow and sleeping bag liner, which was good. No kids around, so I packed him up and broke down the tent, and loaded the car, waiting for him to get back from whatever ceremony was going on. He walked up, stiff and slow, and I know it had been a long weekend, but he looked good. He wasn’t frazzled from being on his own and I think he grew up quite a bit. He was definitely proud of surviving and some parents that were OA people told me he did really well with his vow of silence from Fri night to Sat night. He said it was hard, working to set up summer camp tents and also working on limited food for breakfast/lunch. He ate two salads and two servings of dinner and was tired from the weekend. But he felt good he’d been through it and was proud of his sash and beads. Read to move to the next phase of his OA initiation. It’s amazing to think of my little girl being 10, but she is. A quiet day so far, but we’ll be heading to Dave and Busters in awhile to celebrate with the whole family. Blogger has been having issue, and they were essentially down for the last two days whenever I went to do something. Grrrr. This has me thinking to move to Wordpress. It seems that my feeds are full of political stuff today. I found this item, noting Obama is acting as a moderate Republican from the last decade. I tend to agree with it, and it has felt like the GOP is shifting further to the right, not maintaining and fighting for their beliefs. In fact, it seems that the party line in the US these days is opposition. We don’t have strong feelings about a particular position, we just want to oppose the other guy, no matter how we have to shift to do it. It’s one reason I think I found myself shifting to a more Libertarian position in the last ten years and have voted that way a number of times. I like that singular stances they have, unchanging over time, and acknowledging when they agree with the GOP or Dems. I mostly agree with the platform, though I think a few things won’t work. Health care and retirement, left to the individual completely, will fail. We are too human, too unwilling to plan for the future (as a group), and I can see us potentially ending up with a skew of our elderly populations sliding towards the poverty lines. Delaney finished his First Aid merit badge a month ago, but this was the first meeting we've been to since then and he turned in his paperwork, so he's official. That's his 3rd Eagle required, and he's a discussion with a counselor away from his fourth. Very proud of his work. Last night I had planned to go to karate, but I needed to also get Delaney a checkup for his Order of the Arrow ordeal camp out this weekend. We dropped into the urgent care in Parker, got told there was a bit of a wait, but since we got into the first checkout room for height/weight/blood early and thought we were doing well. However that wasn’t the case. We sat in the second waiting room for 45 minutes before spending 5 minutes with a doctor. Delaney’s fine, 5’ 3”, 119lbs, and very healthy. Ready to camp. 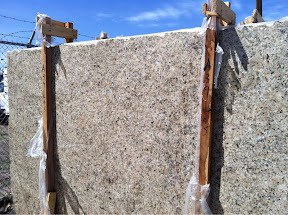 We ordered new granite counters for the kitchen recently and one of the options was for us to go pick out the actual slab. 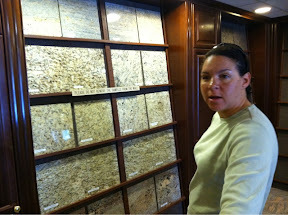 Tia looking at various samples of the color we picked at the store. Another afternoon of tennis, this time with Kyle as well, and the kids are loving it. Both little kids were reluctant to leave the court on Sat and Sun night, with Kendall begging to go back for just 15 minutes while we were eating dinner Sun night. It’s cool to see them interested, and both Tia and I are thrilled. We remembered how much fun tennis can be with each other. We worked with the kids on volleying back and forth and Kendall even started to work on a serve, getting excited to hit the ball over. I hope the kids continue to enjoy tennis as it’s great exercise and a fun family activity. Two days of time in the sun, tennis with the kids, and yard work, wore me out. I woke up last night with a headache, one I think I had from a little dehydration. Aspirin and water helped me go back to sleep, but this morning I felt a little dizzy and light sensitive after taking the kids to school. Peanut butter, and a little rest with my eyes closed helped. Our children are the future. Whether we like it or not, we will cede control to them at some point in our lives. It’s one of those things that makes me believe the investments in education are important, perhaps even more important than some of the other places where we spend money. This is a great talk from John Hunter, teacher in my native VA. It talks about a game for fourth graders that helps them to learn and understand the world, and in many ways, learn to think about their impact on the world. It’s humorous and inspiring. Someone that recognizes children are not only our future, but that they have perspectives worth listening to. The kids are sounding better in Delaney’s 7th grade Orchestra class. I know because he had a concert last week. He arrived at the bus stop on Wednesday afternoon with his cello. I asked him why it was coming home (it usually doesn’t) and he said he had a concert that night. Nice notice! Apparently he had told Tia, but I wasn’t in the loop and she was in Jacksonville. With a sick Kendall, we got prepared to go, getting homework and dinner out of the way early. Another joint concert with the high school orchestra, which means long. Still, Delaney’s group did three pieces that sounded OK. I have high hopes for him continuing to high school and learning to play much better. They did three pieces again, and then a combined piece with the high school. I didn’t record the combined one because the stage was so busy and Delaney was buried behind people in that one. However he was concentrating quite a bit on the others. I’ve uploaded two of the pieces and thought they sounded pretty good. The Girl Scouts headed down to Colorado Springs this morning to the Squeek Soda Shop. I’m not sure how they found this place, but it was their trip after selling enough Girl Scout cookies to pay for it. It’s a little shop in a plaza near a library, and evidently fairly popular. Quite a few people stopped in while we were there. It’s colorful, murals on the wall, and built somewhat like an old fashioned soda shop, but with more modern décor. The girls arrived early for a private mixology class with the owner, who had them taste selzer water, simple syrup, various acids, and then flavors, showing them how to mix them up. The kids had a good time, working their way through the different courses. Delaney got to participate as well and was very careful in his measurements. The kids each got to pick their flavor at the end, along with a color and create their own mix of flavors. Delaney went for a cream soda, and Kendall some blue concoction, cotton candy I think. They were very proud of themselves, enjoying their sodas while they ate lunch. I wandered around, amazed at the various selections of soda, and a wall of candy. With popcorn and ice cream, it’s the spot where I am sure many kids would want to hang out. They even had a display where you could smell different flavors and help you to make a selection. The décor was neat, and they had a great artist for the walls. Lots of fun sayings like this along painted in places, including the bathroom. A very cool time for all. After lunch, a little Wii for Kendall and friends before we packed up to come home. A friend was having issues setting up a wireless connection and I agreed to help out. I arrived to find an external BENQ AWL300 adapter plugged into his USB port with the “Validating Identity” message in the Windows wireless networks dialog. Unplugging/replugging it in brought a similar message along with a “certificate could not be found to validate” this. Other machines could connect to the router, so I suspected that wasn’t the problem. I didn’t have my laptop, so I dragged the adapter home to test on my laptop. I found drivers from CNet and started downloading them while I searched the BenQ site. No mention of wireless adapters. It’s almost like they were never made, except Google finds some pages. I even found a few that suggested removing 801.1 connections and clearing the IE SSL state, but neither of those had worked. I started the setup on my laptop and it went through, but asked me for infrastructure or ad hoc mode. That’s almost like an access point setup, or an old adapter setup. Not sure which one it is, but I bailed immediately. I had an old NetGear USB adapter, so I used that to make the connection for my friend and gave it to him to use. What I expected to be a 15-20 minute trip was over an hour with the fussing and two trips. I was glad to help, a little stumped, and recommended that adapter go to the junk heap. They USB antennas are so cheap these days it’s not worth messing with. You never know when the end will come. A good friend of mine died a couple weeks ago at the age of 47. He left behind a wife, 4 children, and many friends and extended family. He never saw it coming. In The Last Post, Derek Miller is dead, he knew it was coming, and prepared a post. We don’t know when the end will come, but it will come. We are all dying, hopefully slowly, but at some point we will move on. Invest for the future, work to build the life that matters to you, but don’t forget to live along the way and enjoy your short time in this world. I booked a party for Kendall’s 10th birthday at Pump It Up today. I booked 25 kids, but when Tia and I talked later, she said that was too many. So I went tonight to pick up the invitations and change it to 14. When I did, I asked Kendall if she might want to do the GLOW party, which is neon and black lights. She was a young lady, politely asking the person at the desk what the GLOW party entailed and then getting excited to have one. It’s near seeing her little face light up with something as simple as some glow sticks and some jumping fun with friends. The ankles have been sore. I was actually starting to question whether I ought to lay off running for a few weeks with both feeling tweaked. However today the left one felt better. It's healing, so I ran, feeling good, but didn't push it. I wanted 20+min and 2 miles but decided to take it easier.